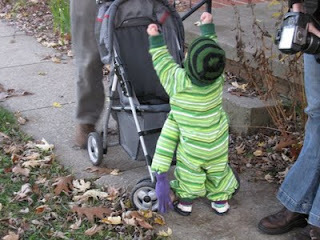 Excited that we're letting him push the stroller. I basically took shortcuts wherever possible when making the costume, so I didn't make a lining for the hood (good thing, since it barely fit as it was) and instead of making a tail I used the tail from our monkey leash and just clipped it to the belt loop on his pants. That turned out to be very useful for steering him around the neighborhood. This stuff is awesomely delicious. And addicting. It's already gone. Gareth really enjoyed the little bits I gave him on Saturday, but on Sunday he decided it was too sticky or something and refused to eat anymore. Ryan and I certainly didn't mind that! We went trick-or-treating with our neighbor and her little girl. Unfortunately, the best picture I got of her was from behind - my front one turned out blurry. She's a bug, as you can probably tell, though it might be hard without seeing her other extra leg I suppose. She and Gareth got "oohed" over an awful lot - I think because there weren't too many other really little kids out. We saw a fair amount of 8-10 year olds and some middle and high schoolers, but not many others as small as our kids. Gareth, of course, didn't remember anything about Halloween, but it only took him 4 or 5 houses to figure out that he needed to open his bag and the person would put candy in it. He did a pretty good job of saying "trick-or-treat" as well when we prompted him to, though he says it "critch-or-treat". It was slightly disappointing how few houses were participating. If there were eight houses in a cul-de-sac we were lucky if two were passing out candy. It's not like Gareth cared though. 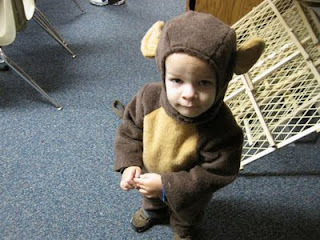 He got plenty of candy and had fun - maybe next year he'll remember what Halloween's all about. 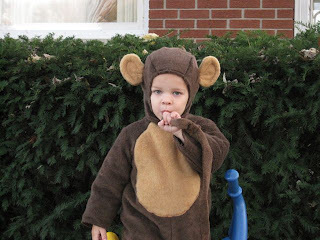 You did a great job on that costume, he looks so cute! 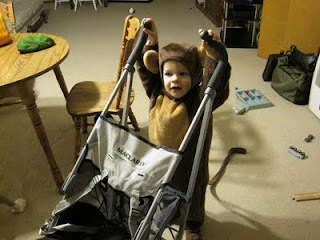 Great costume-making, Erin! I am glad you had a fun Halloween! Good job on the costume! And that popcorn looks very tasty. I really like Gareth's costume! It looks great! P.S. I found your blog from Susan's. It's fun to see what you're up to these days! So cute!!! And the honey popcorn looks good too. 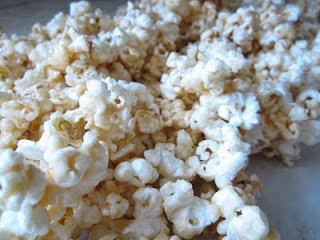 We'll have to get a popcorn popper at some point so we can start making these good treats. And so we can say we officially have a machine for every small thing you could ever want to make... bread, crepes, waffles, hot chocolate.... Love you! 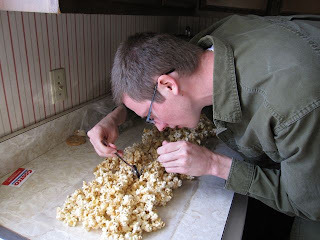 Actually, the nice thing about the popcorn is that you can use microwave popcorn. I just buy the "natural" kind so it's just lightly salted. I knew the picture of Ryan would get some laughs, so I definitely had to post that one.